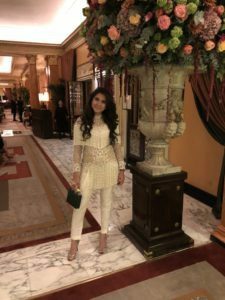 AISPI had the pleasure to interview the inspirig fashion designer Sherina Dalamal, soul of Cherie D. Born in the UK, she has always been influenced by her Indian roots. 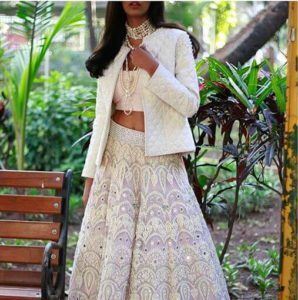 Her creations, with the extreme elegance and glitz of Indian princesses, have been designed from an international approach that make us DESIRE them. 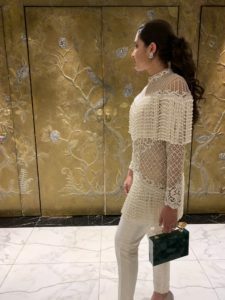 She designed a complete custom made pearl, thread and net cocktail outfit for our founder – you can see the details in the images below! Keep reading to know more about the brand and the artist, but also the business woman behind it. 1. How and when did you start designing? I’ve always been into designing; it was something that came very naturally to me at a very young age. 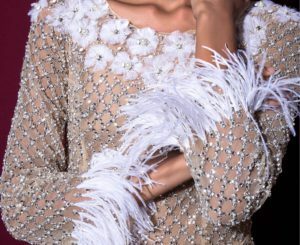 The first piece I designed was one of my birthday party dresses when I was really young: I was 6 or 7 years old and my mum asked me what I wanted to wear, and we designed a piece together. And then much later it organically developed into a business when I was 16. 2. We know that you manufacture in India but, why specifically in India? Why would you encourage people to manufacture their products there? 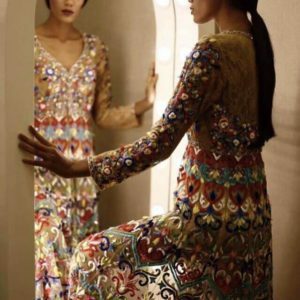 I think where you manufacture depends on your brand focus, and my brand focuses on couture embroideries. So, I just wouldn’t encourage people to only manufacture in India, I think every country has different strengths, and with India it is the skill set. People there are able to produce beautiful embroideries that they are not able to achieve anywhere else in the world. 3. Where did you grow up? Has this influenced your design inspirations? I was born in London and grew up in London, where I also did couture training. I then moved to Paris to pursue it further. After that I moved to India and started my brand, which just organically moved from one step to the next and it grew over the past 10 years. The brand it is still based out there, but I now run it from LA where I am married. I feel that each chapter of my life has shaped my designs and has shaped my identity and that is reflected in my work. 4. What would you see as the biggest difference and the biggest similarity in these three phases of your life? I think that being in touch with so many different people and coming into contact with so many different cultures makes you grow as a person, and your designs grow, you develop in a certain way, you see things differently, from a different angle. But at the same time, you find yourself, and that I think is what stays constant. 5. Can you tell me about your favourite embroidery pieces? 6. In Europe, people are not used to customization in couture, when they think about it they think about 10.000€, 20.000€ outfits. What do you think? 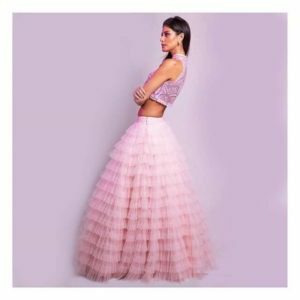 Tell us a bit about the process and price range of a customized outfit made by you. After all these years, I’ve seen that customization works better in the East; people are more used to this concept. But I also think that it is translating more to the West because more and more people want pieces that are personal and different. About the customization process, we would first take the measurements, then we would show the sketches to the customer, and finally we would send them the embellished design. The price range for customization embroideries would start from 1000€ and it would go up to about 5000€, depending on the type of materials and crystals we use, and the intensity of work hours. 7. Let’s now talk a bit about what is like to be a woman founder, and entrepreneur. Tell me a little about your journey, which have been some of your challenges from a business point of view and how did you overcome them. When it is something you are so passionate about, you have to take every step as it comes and really invest yourself in it. At the same time, I think it very important for every woman to have something for herself, something that she has created and that she has invested in. A side from her family, a side from her partner, a side from her kids, it gives you huge sense of identity and a sense of satisfaction. There is always space to have as much as you need in terms of balancing up your life. 8. For emerging designers specifically, in this business there is so much going on, it is very congested… What can they do to stand out? Could you give them some tips for starting up? I think that the right approach in this line of work is being true to yourself. You have to define your identity, you have to put in the time, there is no quick results. Also, take the time to do a business plan; If it doesn’t make sense economically, then don’t get into it because you will end up burning your foot. Yes but, how do they know if it is good or not without trying it? It is important to not put all your eggs in one basket. If you start, start with a clear mind and a clear direction, work towards your plan systematically. It will let you see things grow at a pace that you understand and that you can cope with. Basically, I advise to do it slowly and steadily and just take one step at a time and be true to yourself through all that process. Did you enjoy what you read? Click here to discover many other brilliant designers that will be the faces of future fashion.